The art of water colors � Isabelle is a Professional French artist and a source of inspiration to many students at the cultural foundation Abu Dhabi. also create an album for people who are interested in art to view. 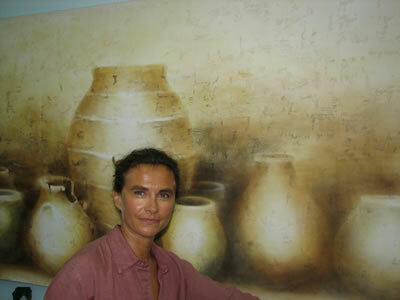 Isabelle Riou Teisseire is well known in Abu Dhabi to those who have a passion for art and painting. She imparts her knowledge and trains 25 students each time. She conducts water color classes on every Tuesday (once a week), at the Art workshop of the Abu Dhabi Cultural Foundation. �Art is an inborn talent and a divine gift � Practice makes you perfect�, says Isabelle Riou Teisseire with a smile on her face. She believes that �all artistic inspiration is a divine gift of God and only an art teacher can help in bringing out the hidden talents and potential in each student. Each and every person is gifted and it is every individual�s responsibility to find out the hidden talents and explore the opportunities�. Every individual has to be creative in some field or the other. Creativity is the key word and it is a question of how the artist feels deep inside and expresses himself through various mediums. Isabelle had a wrong perception of water colors during her childhood days. She had a great interest in drawing and painting when she was very young. During those days she used to think that painting was an easy task. At the age of 15, her teacher at Beaux Arts School in Toulon, France noticed her desire to learn water painting and showed her the right direction. From that time onwards her desire to learn artwork through sketches, water colors and oil painting grew and there was no turning back. My passion for art grew by leaps and bounds and then I had a clear vision and took this up as my profession. Who motivated her to learn artwork? Isabelle�s elder brother was an artist and she used to watch him right from her childhood days. It was her elder brother who showed her the right direction. He was my first teacher, and home was my first art school. He opened the door of art to me and then this desire grew and I enrolled in an art school later on to enhance my skills. Without his support and inspiration I would not reached this stage, admits Isabelle. Soon after completing her baccalaureate, in order to pursue her interest, Isabelle enrolled fulltime, at the Beaux Art School, in the south of France and learnt all the delicate and minute details in art. Something that began as a hobby helped her lay a firm foundation and grow in this field. Can you name some painters that made a real mark on your life or inspire you? With a beaming smile she says that there are several painters in this world that inspired her. Cezanne a French artist, for his landscape, approach and use of color. Turner a British artist for his poetic style and emotions. Ferrer a French sculptor for his spontaneity with different mediums like wood, clay, plaster, stone, marble or metal. Fabienne Ariett, another French artist and painter for her skills in acquiring texture in her paintings and a real genius in sketch work. Isabelle got married in the year 1985 and then moved to Germany and spent some few years in there. But her art exhibitions were held in her hometown itself. She first held her solo art exhibition in the year 1992 in Toulon France. In that show she had about 30 water colors, and her paintings included landscapes, boats, and different animals like elephant, lion, tiger, giraffe, bears, and camels. The elephant had a special appeal and I used to love drawing elephants in different angles she says. People who came to see her paintings bought them and this encouraged and supported her a lot. How do you find the life in U.A.E? She arrived in U.A.E in the year 2000 in search of greener pastures and got an opportunity to work as an arts teacher at the Abu Dhabi Cultural Foundation. I love to interact with people of different cultures and learn so many new things from them. I also love this place the weather and the comforts this place provides. An artist can discover new landscapes like the deserts and mosques, sharp contrast in light, colors, animals and nature. I love Arab culture and traditions. I love the desert areas and the corniche too. How do you allocate your time for family and your profession? Isabelle is blessed with three children, and as a mother of three she says that initially it was very difficult for her to allot time for her family and profession. Family life would be in chaos if she were to devote eight hours to her artwork. Life was a little difficult when they were small and that time she would devote 6 hours only for her art. Children and her husband would leave home at 7.00 in the morning and return at around 2.30 p.m. Moment they were back home she would devote her entire time to them. The weekend would be again for the family itself. Certain paintings would take days to finish and if I were to sit down to paint with full concentration then I would finish one good painting within a few hours. It all depends on the time, mood and concentration. Right from the start my families has been very co-operative and have given their full and whole hearted support for my artwork. What do you plan to do in future? Now that my three children have grown up, I help and motivate my students to hold exhibitions at the Delma Center inside the Cultural Foundation Abu Dhabi. When I see my paintings adorning the various offices at the Cultural Foundation it gives me real sense of satisfaction and joy. My elder two daughters Charlotte and Capucine are in France. Capucine is following my footsteps and my youngest daughter Cammille is with me here in UAE studying in the university. I wish to start a studio and an arts gallery back in France, where different artists can work together in future. A studio for them to work and interact and a gallery which will provide them with a platform to exhibit their paintings and artwork. However this dream of mine will become a reality if I get friendly, communicative and confident artists around me. I have this vision of turning this dream into reality in the near future and my philosophy in life remains to walk holding my head high and listening to your heart and your voice deep within � the inner core. (As told to Claude Francis Fernandes).